What common experience have Malala Yousufzai and some of the young shooting victims of Parkland and Sandy Hook schools shared? After being at the receiving end of life-threatening shootings, they became targets of the slings and arrows of conspiracy theorists alleging the attacks were staged. 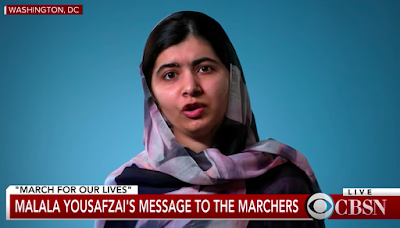 Malala acknowledged this fact in her video message to American student marchers recently. Malala Yousufzai was shot in the head by Pakistani Taliban in Swat Valley in 2012. She luckily survived after being airlifted to a hospital in Pakistan where the doctors operated on her to save her life. Later, she went through additional surgery and rehab in England where she is now a student at Oxford University. As if her physical ordeal was not enough, some anti-West right-wing conspiracy theorists attacked her for being a willing participant in a "staged" shooting to defame Pakistan. The fact that Malala was given multiple awards, including the Nobel Peace Prize, only added to the anger of such groups. The students at Marjory Stoneman Douglas High School in Parkland, Florida, saw a mass shooting in February, 2018. Seventeen people were killed and seventeen more were wounded, making it one of the world's deadliest school massacres.
" A similar story is playing out now in the United States......These haters say the grieving victims (of Parkland mass shooting) attract attention they don’t deserve, come off as sanctimonious and self-righteous, are frauds, and are “being funded” and “given scripts.” The gun massacre survivors are branded as Nazis, targeted in doctored photo campaigns, and even mocked for college rejection letters..."
Adam Lanza shot and killed 20 children of ages 6-7 years and six adult staff at Sandy Hook Elementary School on December 14, 2012, in Newtown, Connecticut, United States. As the parents grieved for their lost babies, they were subjected to conspiracy theories branding their tragedy an elaborate hoax. They were accused of being hired actors in a performance staged to bring down the National Rifle Association to kill the Second Amendment. Students across the United States organized a protest they called March for our lives to demand gun control laws. At the marches, Malala Yousufzai spoke live via video link to acknowledge similarities between her shooting and the Parkland shooting. Malala explained what she and the Parkland survivors share in common: They experienced violence and injustice, and they decided to speak out. The mass shooting at Marjory Stoneman Douglas High School in Florida has brought back the horrible memory of the tragic mass shooting at Army Public School in Peshawar, Pakistan on December 16, 2014. The Peshawar school mass shooting claimed 149 lives, making it the world's second deadliest mass shooting at Beslan school in Russia where 334 people were killed. The Parkland, Florida school shooting was the world's 10th worst with 17 dead. 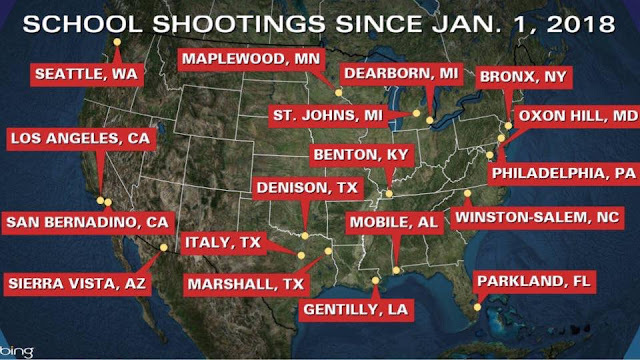 Five of the world's 10 worst mass shootings have occurred in the United States. The rest of them were one each in Russia, Pakistan, Kenya, Israel and the United Kingdom. On the morning of December 16, 2014, six gunmen affiliated with the Tehrik-i-Taliban (TTP) entered the Army Public School in the northwestern Pakistani city of Peshawar and started shooting. All six were foreign nationals, included one Chechen, three Arabs and two Afghans. By the time the Pakistani Army commandos arrived and killed the attackers, 149 people including 132 students, ranging in age between eight and eighteen years, lay dead. The Peshawar attack galvanized the Pakistani people to take on the Tehrik-e-Taliban Pakistan (TTP) and other terrorist groups. The Pakistani military launched a nation-wide operation Zarb e Azb to bring about a dramatic reduction in terrorist violence in the country. On the afternoon of February 14, 2018, a lone gunman entered and started shooting at Marjory Stoneman Douglas High School in Parkland, Florida. Seventeen people were killed and fourteen more were taken to hospitals, making it the world's 10th deadliest school massacre. The suspected, 19-year-old Nikolas Jacob Cruz, was arrested shortly afterward and confessed, according to the Broward County Sheriff's Office. The suspect was a student at Marjory Stoneman Douglas High School. He had been expelled and was angry. He used an AR-15 assault rifle to quickly kill over a dozen of his fellow students. AR-15 is easily available in the United States, It has become a weapon of choice for mass shootings in America. 2017 Las Vegas mass shooter who killed 58 people also used a modified AR-15 rifle. Conspiracy theorists' attacks on survivors of Parkland school shootings in US state of Florida are no different than similar attacks on Malala Yousufzai in Swat Valley, Pakistan. They have all been accused of being part of staged attacks for political purposes. While school shootings have occurred in many countries around the world, no other country has seen as many and as frequently as those in the United States. New York Times analysis of the Gun Violence Archive found that there have been 239 school shootings since 2014, including those on college campuses, resulting in 138 deaths. The biggest reason accounting for it is the ease of access to the deadliest of assault weapons in America. Will the US Congress act this time in defiance of the gun lobby? 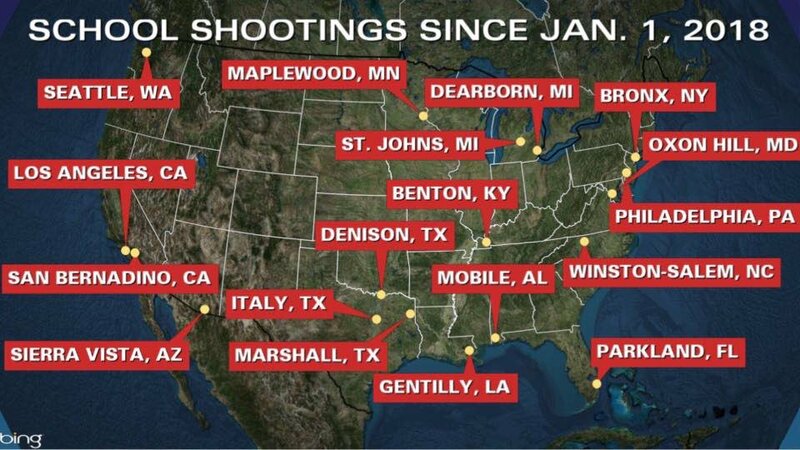 Given the track record of US legislators after worse massacres than Parkland, I wouldn't hold my breath. However, the response of the students has been much stronger and more sustained than in the past. I hope that they succeed where others have failed. Is US Gun Lobby Empowering Terrorists? The comparisons with Malala Yousafzai began as soon as Sabika Sheikh was identified as one of the victims of the Santa Fe High School massacre. One, Malala, was shot on her way to school by a militant in Swat, near Pakistan's border with Afghanistan. The other, Sabika, was shot by a fellow student inside a school in Santa Fe, Texas. But, as many ruefully pointed out, that's where the comparison ends. Will Sabika be the next Malala, asked Asfandyar Bhittani, who writes for the Frontier Pakistani blog. "Nope," he said. "We all know Sabika Sheikh will be forgotten before next weekend." After Malala was shot, her cause was taken up globally. She became the face of the barbarism of the Taliban, which didn't hesitate to shoot a child in the head to stop girls from attending school. "We sacrificed thousands of our servicemen so people overseas could be free and have an education and be rid of the gun-toting Taliban," Ranita Sharif, a teacher in Birmingham, Alabama, told CNN. "When we will be free of the gun-toting murderers here?" At the root of the frustration is the notion that Sabika's death will do nothing to effect change in America's scourge of gun violence. "Sabika died trying to get an education too," Asif Hussein, a Pakistani-American who lives in Atlanta, told CNN. "Will there be a Malala-like movement for her? Or will we just get more of the same - 'thoughts and prayers'?" Sabika was one of eight students who, along with two teachers, died at Santa Fe High School on Friday. The 17-year-old was in an exchange study program. She was supposed to return home to Karachi for the Eid holidays. Pakistan's Prime Minister Shahid Khaqan Abbasi summed up the tragedy of her death. "Extremist activities are not limited to one nation or region alone," he said. "They are an international problem." Investigators say school shootings have become the American equivalent of suicide bombings — not just a tactic, but an ideology. Young men, many of them depressed, alienated or mentally disturbed, are drawn to the Columbine subculture because they see it as a way to lash out at the world and to get the attention of a society that they believe bullies, ignores or misunderstands them. SANTA FE, Tex. — The exact reasons a teenage gunman shot his fellow students and teachers here at Santa Fe High School remain a mystery. His model for carrying it out is more clear. The 17-year-old junior wore a black trench coat and fired a sawed-off shotgun, the same attire and weaponry used by the two gunmen who killed a dozen students and a teacher at Columbine High School in Colorado in 1999. His crude arsenal included canisters of carbon-dioxide gas and Molotov cocktails, two types of explosives used by the Columbine gunmen. The picture he had posted of his trench coat on Facebook showed a small red-star medallion with the Communist hammer-and-sickle on the collar, the same type of button a Columbine gunman attached to his boot. It was not the first time a high school suddenly engulfed in gunfire and death found itself looking for clues in the random symbology of a nearly 20-year-old mass shooting that has become, it seems, the standard by which youthful gunmen across America have come to measure themselves. The 20-year-old attacker who killed 26 people at Sandy Hook Elementary School in Connecticut in 2012 had compiled an enormous mass-murder spreadsheet and materials on the Columbine attackers on his computer, including what appeared to be a complete copy of the official Columbine investigation. The May 18 mass shooting at Santa Fe provides the latest evidence of a phenomenon that researchers have in recent years come to recognize, but are still unable to explain: The mass shootings that are now occurring with disturbing regularity at the nation’s schools are shocking, disturbing, tragic — and seemingly contagious. Interviews with law enforcement officials, educators, researchers, students and a gunman’s mother, as well as a review of court documents, academic studies and the writings of killers and would-be killers, show that the school-shooting copycat syndrome has grown more pervasive and has steadily escalated in recent years. And much of it can be traced back to the two killers at Columbine, previously ordinary high school students who have achieved dark folk hero status — their followers often known as “Columbiners” — in the corners of the internet where their carefully planned massacre is remembered, studied and in some cases even celebrated.